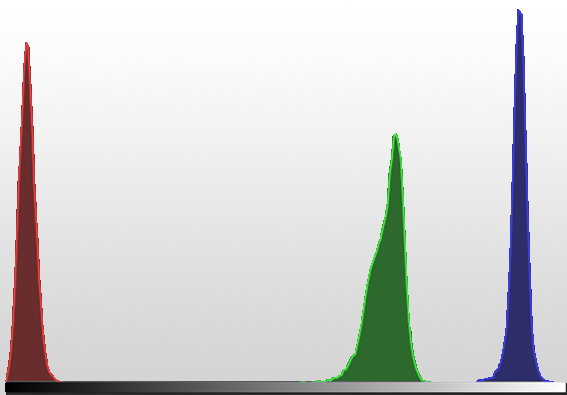 If you take flatfield images with an Aurora flatfield device and use a filter against light pollution (such as the Astronomik CLS or CLS-CCD), you will notice that the RGB histogram looks very unattractive: On the far left a sharp peak for the data from the red channel, on the far right two sharp peaks for the data from the blue and green channel. 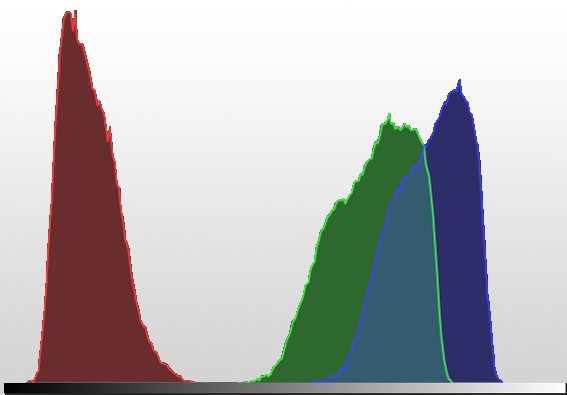 It is relatively difficult to achieve a good flatfield correction with such a histogram, because the data in the blue channel are already close to the saturation limit, while the data for the red channel are relatively noisy, because the peak is at the far left. With the Aurora LPR conversion film you get a much more balanced spectrum with which you can easily obtain good flatfield data even when using a filter against light pollution. Flatfield correction will be very easy when using this conversion filter! The Aurora LPR conversion film is available for the sizes 10cm, 160mm 220mm, 315mm and 420mm. The filter foil can be quickly and easily installed in your Aurora. If you order an Aurora together with ND filter foils or the Aurora LPR conversion foil, the delivery is made with already mounted foils!